As first dates go, the first formal get-together between British Prime Minister Theresa May and newly elected US President Donald Trump wasn’t bad. But if Ms. May is to turn this into Thatcher-Reagan redux, and partner with Mr. Trump to produce the legacy-defining accomplishments for her premiership that she seeks, she may need a little dating advice. The Hysteria on US “ Muslim Ban” What are the Facts? Fake news indeed. There is no Executive order banning Muslims. President Donald Trump’s, perhaps ill-founded, ill-fated 90 day ban is based on President Barack Obama’s restrictions on Seven nations. Nobody cared when he did it, so was it a Muslim ban then? The law was written to address security concerns after the Paris Attacks, passing with overwhelming agreement. Voting was bipartisan, it passed the House 407-19. What Trump did was apply a sharp force, a halt on movement, and cruelly with no notice to let people prepare. Let the people decide if it is wrong, but to call it “Muslim” in nature, is also wrong without reading the full executive order. Kate Burrows-Jones, North America Editor . 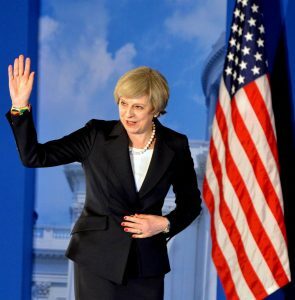 Distinguished as the first world leader to make an official visit to the new American president, Prime Minister Theresa May stood out as something else, an articulate and persuasive, Twenty First Century Iron Lady. She reminded her Republican audience of the best of Britain and America’s grand mutual historic past through world war and cold war, “It is the relationship between us that has defined the modern world.” She touched down on the common ground of British conservatism and Republican ideals of liberty, representative government, the dignity of work, the principle of nationhood, fiscal responsibility. Although most Members of parliament MPs who ( I’d say 90%) asking for a government white paper are a die-hard remainers/remoaners who’s aim is to delay and frustrate plans to trigger Article 50 hoping for a second referendum a handful are genuine in holding gov to account. But parties are standing in different position on the issue, only one Tory MP is with remain for example on triggering the article by end of March as the Prime Minister stated. In reaction to the Supreme Court Ruling which went against the government, the latter is preparing a bill before parliament within days as secretary of State for Leaving the European Union David Dvis MP told the commons yesterday in a heated debate that helped flush out those who want reverse the result of the EU referendum. British Prime Minister Theresa May will meet with President Donald Trump in the US on Friday. 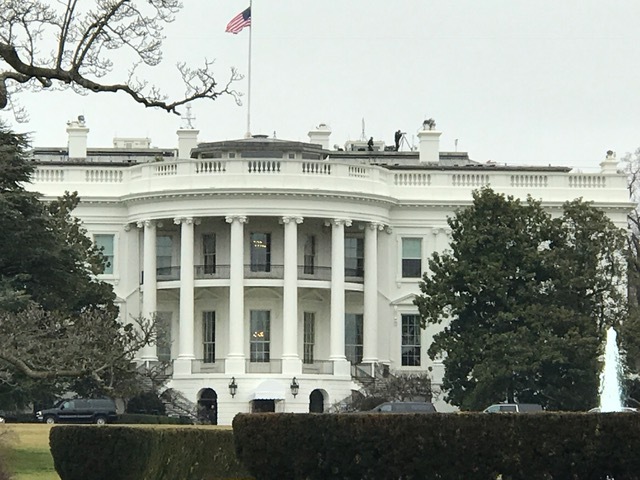 Trade is set to be at the top of their agenda, as his spokesman, Sean Spicer, said in a press briefing on Monday, adding that the American leader was looking forward to a positive and warm meeting. “We always had a close and special relationship, but we can also be closer,” the White House Press Secretary told reporters. 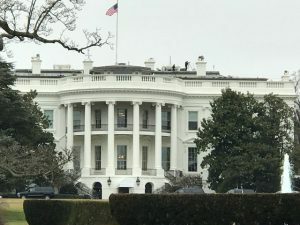 The Prime Minister will be the first world leader to meet with the US President indicating a resounding reinforcement of the special bond between the US and UK. The Prime Minister is expected to talk about free trade and NATO. 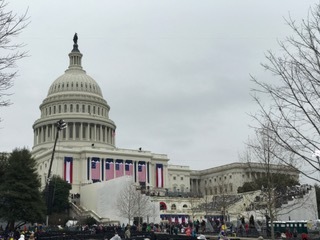 Mr Trump Goes to Washington-And Takes It Out To The Woodshed. 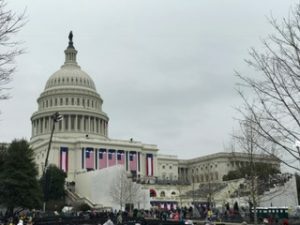 Sworn into office, the keys to power transferred, former President Obama thanked and acknowledged for a ‘magnificent’ transition, President Donald J. Trump brandished a rhetorical cane and set about delivering a verbal spanking to the Washington, DC establishment — much of which was arrayed on the stage behind him, including four of the five living former presidents. The United States is in an unusual position having so many living former presidents that the booming smack was louder than it might have been. Powerful presidents and leaders who shaped generations sat behind him. President Jimmy Carter, President Bill Clinton, Secretary Hillary Clinton, President Obama, First Lady Michelle Obama, President George W. Bush and First Lady Laura Bush (President George H W Bush was ill and could not attend) Their expressions could not be held back for all the years of practice and became a news topic. Michelle Obama’s shocked look was most prominent. Syria Peace Talks Start in Astana Next week: Minefields Ahead? Talks due to start 23 January in the Kazan capital Astana between Syrian government and many opposition, armed and civilian groups, and their backers in a settlement process sponsored by Russia and participation of Turkey, Iran and possible Gulf Arab states raising hopes to end to a five year blood civil war; but there are several dangerous mines on the road The talks were part of a comprehensive plan started with a Russian Turkish imposed ceasefire on December 30. 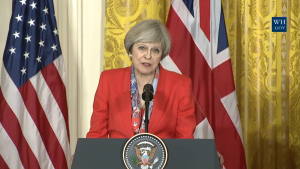 Speaking from Lancaster House, where Britain announced entrance into the single market, the Prime Minister announced the UK’s departure, making her most detailed statements yet on the Government’s Brexit strategy. The Prime Minister has declared that Britain will be independent of the European Union, a sovereign nation. She will pursue a clean break from the EU, making clear that Britain will no longer be part of the EU but emphasising its new role as a global trading nation, governed by a unified British people, not by a supra-national power. She will restore parliamentary democracy to the UK. 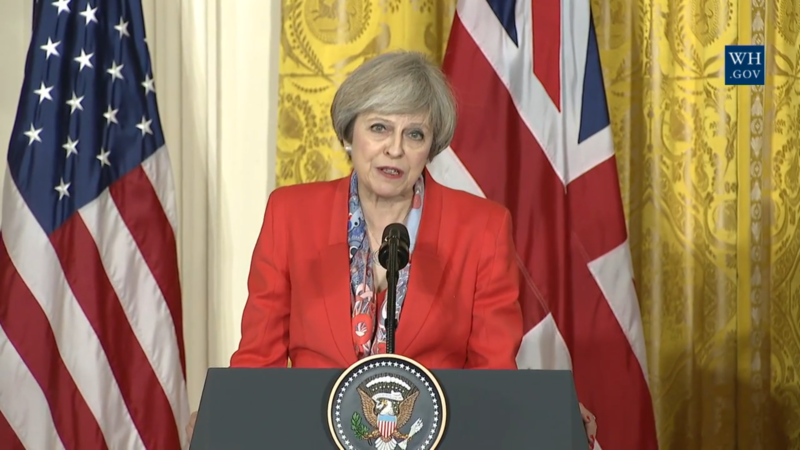 Throughout the speech, the Prime Minister returned to the theme of a “Global Britain,” a world leader in free trade. The Prime Minister laid out a 12 point plan to leave the EU. The official account of the Prime Minister, @Number10gov, tweeted out the major points while the speech was in progress. 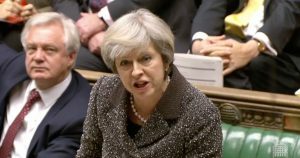 May has promised to be clear wherever possible with the British people, the public sector, and business leaders. The same rules will apply to all sectors after Brexit as before and the final deal will be put to a vote in both Houses of Parliament. This news produced a strong rally in the pound against the dollar and the euro. Membership in the single market will not occur because membership would leave EU law with ongoing sway over the UK: “Luxembourg will not have law-making powers.” She stressed that membership in the customs union would bind Britain to EU rules and would need to take a new form. It could be negotiated. The Prime Minister strongly pledged to strengthen the bonds of the united United Kingdom keeping the union intact of Scotland, England, Wales, and Northern Ireland acting in the interests of the devolved powers. She pledged to protect each one’s interests in any deal and to protect common resources. A deal that allows for the common travel area between the Republic of Ireland and the UK will be an important position for the UK. She stressed families and relationships as a foundation for an open travel area. The two countries had open borders before they both joined the EU. The UK will take a position to protect the rights of EU nationals in Britain and British nationals in the EU. A pledge to protect the rights of British workers following Britain’s departure from the Union. The UK will go global, and seek to restore its position as a world leader in free trade, seeking agreements with the United States, the Commonwealth, India, and the European Union. She stressed both a desire for and a belief in the mutual benefit of free trade with the European Union. The UK will take a leading role in science and innovation. To the mutual benefit of the UK and the European Union, she said a phased approach to Brexit must occur for the stability of both. Prospect for US Trade Deal Gives May Timely Brexit Leverage. In a keenly anticipated speech this morning, Prime Minister Theresa May is expected to formally announce that the United Kingdom is leaving the European Union and will present a strategy to do so. May will respond to critics, who have accused her of lacking a clear strategy for Brexit, by providing more detail than ever before regarding the Government’s plan. This comes as the Chancellor of the Exchequer , Philip Hammond, pledged that the country would do whatever it has to do if the EU attempts to impose tariffs and trade restrictions on the UK when it has left the EU. Westminster, January 7, 2017. The Prime Minister Theresa May called Turkish President Tayyip Erdogan earlier today to discuss the Cyprus peace talks, according to N10 Downing Street .